Using high-quality DuPont Lycra fiber, intelligently adjust socks tightness, it is not easy to loose. Apply with breathable mesh with crack pattern, not only has perspiration function, but also present a new trendy sport fashion. Heel with Y-weaving, ergonomic, to prevent falling off, more obedient. A bigger heel zone for better fitting and comfort. Eliminates bunching. Stretch air cushion covered with shock, buffer pressure. Elasticity terry loop can absorb the shock and reduce the pressure. Feet on both sides of the foot support a solid design, strengthen the grip, reduce the movement of the displacement. On the both side of the feet has a stable support function, it can strengthen traction and reduce slippage. 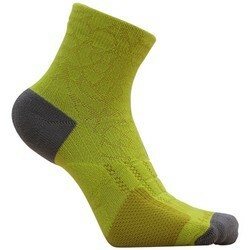 Large area of breathable mesh has moisture wicking function, keep your feet dry. Seamless technology remove the thick and hard car suture, comparable to the purpose of the perfect hand to the body, the effective prevention of blisters. Instead of traditional linking, seamless toe are finished knitting with flat toe seam construction to deliver superior comfort and reduce irritation.